The water quality needs to be monitored at regular intervals, throughout representatively located gauging stations, for sustainable development of water resources. However, it is not possible to monitor all quality parameters all the time and points for a river basin studied, and water quality monitoring that does not address specific, clear and realistic objectives will cause time, labor and money losses. At this point, Principal Component Analysis (PCA) would provide a regional insight into principal pollutants, contaminants dominates others and effective monitoring locations. It will help to evaluate surface water quality in regional scale as well as monitoring network. This study aims to analyze regional water quality and monitoring network in the Gediz River Basin, by focusing on the variance structure of the observations on principal pollutants that observed throughout the river basin. The 11 quality parameters monitored in 13 monitoring stations on the Gediz River Basin were used in the analyses. PCA is applied i) to determine principal pollutants and contaminants dominate over others (parameter-based analysis), ii) to find out effective monitoring locations for principal pollutants (station based analysis). The results reveal the tributaries of the river with different quality characteristics, and the importance of an objective based monitoring for effective water quality management. 1. Kurunc, A.; Yurekli, K.; Okman, C. Effects of Kilickaya dam on concentration and load values of water quality constituents in Kelkit stream in Turkey. Journal of Hydrology 2006, 317, 17-30. 2. Vega, M.; Pardo, R.; Barrado, E.; Deban, L. Assessment of seasonal and polluting effects on the quality of river water by exploratory data analysis. Water Research 1998, 32, 3581–3592. 3. Reisenhofer, E.; Adami, G.; Barbieri, P. Using chemical and physical parameters to define the quality of karstic freshwaters (Timavo River, North-eastern Italy): a chemometric approach. Water Research 1998, 32, 1193–1203. 4. Ahmad, S.; Khan, I.H. ; Parida, B.P. Performance of stochastic approaches for forecasting river water quality. Water Research 2001, 35, 4261-4266. 5. Huang, W.; Foo, S. Neural network modeling of salinity variation in Apalachicola River. Water Research 2002, 36, 356–362. 6. Duran, M.; Demirer, G.N. Su Arıtımında Temel İşlemler (Unit Operations of Water Treatment); TMMOB Chamber of Environmental Engineers: Ankara, Turkey, 1997. 7. Tuncay, H. Su Kalitesi (Quality of water); Ege University Faculty of Agriculture Publications, 512: Izmir,Turkey, 1994. 8. Ministry of Forestry and Water Works (MoFW). Yerüstü Su Kalitesi Yönetimi Yönetmeliği (Surface Water Quality Management Regulations); Republic of Turkey Ministry of Forestry and Water Works: Ankara, Turkey, 2012. 9. Chapman, D. (Editor) Water Quality Assessment; Chapman & Hall, London, 1992. 10. Sârbu, C.; Pop, H.F. Principal component analysis versus fuzzy principal component analysis A case study: the quality of danube water (1985–1996). Talanta 2005, 65, 1215-1220. 11. Johnson, R.A., Wichern, D.W. (Editors) Applied Multivariate Statistical Analysis (Third Edition), Prentice Hall International, New Jersey, 1992. 12. Petersen, W.; Bertino, L.; Callies, U.; Zorita, E. Process identification by principal component analysis of river water-quality data. Ecological Modelling 2001, 138, 193-213. 13. Antonopoulos, V.Z. ; Papamichail, D.M. ; Mitsiou, K.A. Statistical and trend analysis of water quality and quantity data for the Strymon River in Greece. Hydrology and Earth System Sciences 2001, 5, 679-691. 14. Mellinger, M. Multivariate data analysis: Its methods. Chemometrics and Intelligent Laboratory Systems, 1987, 2, 29-36. 15. Farnham, I.M. ; Singh, A.K. ; Stetzenbach, K.J. ; Johnnesson, K.H. 2002. Treatment of nondetects in multivariate analysis of groundwater geochemistry data. Chemometrics and Intelligent Laboratory Systems, 2002, 60, 265–281. 16. Simeonov, V.; Stratis, J.A. ; Samara, C.; Zachariadis, G.; Voutsa, D.; Anthemidis, A.; Sofoniou, M.; Kouimtzis, T.H. Assessment of the surface water quality in Northern Greece. Water Research 2003, 37, 4119-4124. 17. Ouyang, Y. Evaluation of river water quality monitoring stations by principal component analysis. Water Research 2005, 39, 2621-2635. 18. General Directorate of State Hydraulic Works (DSI) Akım Yıllıkları (Runoff Annual). General Directorate of State Hydraulic Works, Ankara, 2000. 19. Ministry of Environment and Urbanisation. 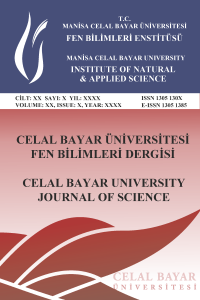 Manisa İli 2015 Yılı Çevre Durum Raporu (Manisa Province Environmental Report 2015). Ministry of Environment and Urbanisation: 2016, Manisa. Turkey. 20. Johnson, D.E. (Editor). Applied Multivariate Methods for Data Analysis. Duxbury Press, Pacific Grove, Kansas, 1998.